NEW and exclusive to Encompass Designs, we are pleased to present THE HONEY HOOK! Named after my little, toy poodle Honey that passed away last October, these hooks are as sweet as she was. There are 10 handles to choose from. True craftsmanship has turned acrylic, pewter and wood inlay materials into these lovely hooks. Beautiful Celtic knots and two sided inlays are spectacular! Plus we have a few Maple without a design for those that like something simpler. The Irish Hook, commonly referred to as the Hartman Hook. Pear shaped indented handle for comfort. Brass hook. Creates less movement to irritate existing wrist problems but can also be used as a preventative so they don't ever start. Medium shank is thicker to open the holes in the backing wider so the wool comes through with ease. The Irish Hook, commonly referred to as the Hartman Hook. Pear shaped indented handle for comfort. Brass hook. Medium and large have a wider shank to open the holes in the backing wider so the wool comes through with ease. Comfortable to hold and beautiful to use. Made especially for us, we offer you the most beautiful hook on the market. Colourful acrylic handles hand-turned and polished to a silky smooth finish that will hold its sheen. The hooks come in Medium for cuts #2, #3, #4, #5 or Coarse for cuts #6, #7, #8. The colours vary each time I order them so tell us your favorite colour and we will choose a match for you. So beautiful one won't do! Click image for larger view. Made in Mahone Bay, Nova Scotia. Medium or Coarse Hooks - $26.00 ea. 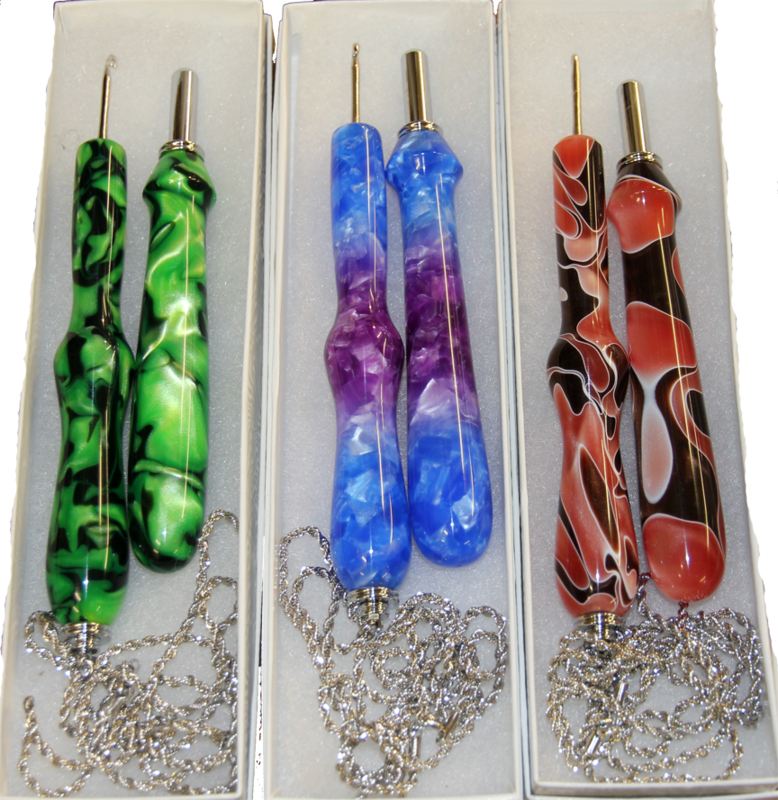 Medium Hook Necklace and Seam Ripper Sets For cuts #2, #3, #4, #5 - $74.95 ea. Course Hook Necklace and Seam Ripper Sets For cuts #6, #7, & #8 - $74.95 ea.